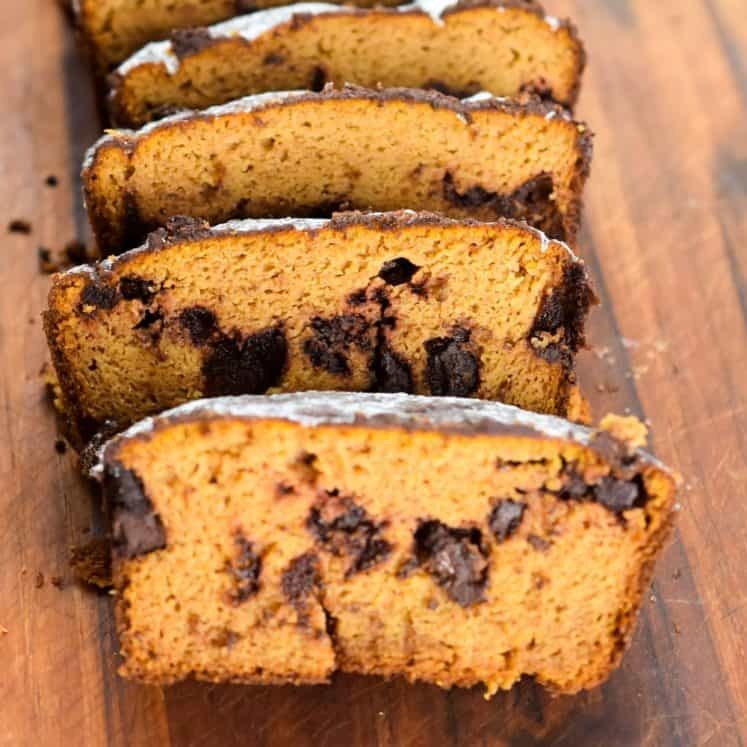 Easy and delicious keto pumpkin bread filled with chocolate! In a large bowl whisk together the flours, salt, baking soda and spice. Then mix in the pumpkin until a crumbly dough forms. In the bowl of your stand mixer beat the eggs, until frothy (about 2 minutes on high). Lower the speed. Add in the melted fat and the sweetener and then bring the speed back up to high for another 5 minutes. Add the egg mix to the flour mix and stir to combine adding in the vanilla extract as you go. Slowly add in the hot water and you stir until the dough becomes a batter. Pour half the batter into a greased loaf pan (standard size). Then add in the chopped chocolate and spread it out. Cover with remaining batter. Bake at 375F, in the middle rack for aprx 50 minutes or until the top is dark brown and a toothpick inserted in the center comes out clean. Baking times will vary depending on your oven. Let it cool for 15 minutes before slicing. 3.2 net carbs per slice when using Swerve and Lily’s chocolate.